DE PERE — The first time Norbertine Fr. Andrew Ciferni witnessed the St. Norbert College football players walking hand-in-hand across campus, he was struck with emotion. As part of a new home pregame tradition, the players make their way to Old St. Joseph Church to celebrate Mass following position meetings and breakfast. “When they come out of Michels Commons, they come out two-by-two,” explained Fr. Ciferni, director of the Center for Norbertine Studies, who celebrates the team Mass on home game Saturdays. “The first time we did it was on a beautiful day in September. … They disappeared behind Main Hall and then came around four-by-four. I almost started crying seeing these young men walking together as one,” he said. The new tradition is the initiative of first-year head coach Steve Opgenorth, a Green Bay native who formerly coached at Colby College in Waterville, Maine. All team members participate. The captains lead the walk with the head coach. A number of players on the roster are not Catholic. Opgenorth explained to the team that the walk and Mass are about more than faith, it is about family. “I believe in the mission of the college,” said Opgenorth. “My mission is to build a football program, character, leadership, communio people. That’s what spawned my ambitions to get us over to Mass. Fr. Ciferni met with the team in advance of the first home game. He wanted to make sure that the players didn’t have any ideas that celebrating Mass guaranteed a win or that God is on their side over their opponent. Time allotted for Mass is 30 minutes, so Fr. Ciferni needed to recruit at least eight ministers. He thought that he may have to knock on doors, but within 24 hours, eight players had stepped forward, all graduates of Catholic high schools. Freshman defensive lineman Stuart Kwaterski is an altar server and extraordinary minister of holy Communion at the team Mass. Pregame Mass gives Kwaterski a sense of comfort. Fr. Ciferni gears his homily for that day on the theme of the week. 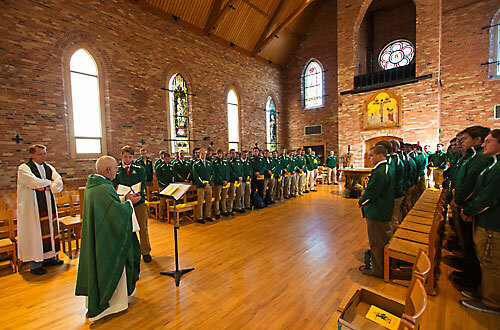 Twenty-three members of the 1974 team joined this year’s squad for Mass on Oct. 25, prior to the Green Knights 29-14 victory over Beloit College. “There were guys, 60 years old, with tears in their eyes because they had a reflective moment of their experience as a student athlete and they could see what we are trying to build,” said Opgenorth. Family members and alumni joined the team for Mass on homecoming. The Green Knights (5-4) close the season on Nov. 15 at Cornell College. The walk and Mass will continue next season, said Opgenorth.